Q – Candace P of Glenview, Illinois asks: My husband and I and our 4 kids (ages 10, 13, 14 and 16) are planning a vacation at the end of July. 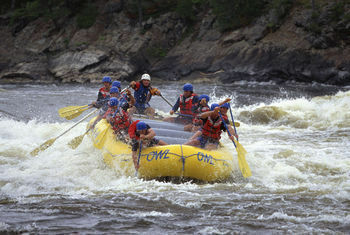 We are interested in rafting, river floating, hiking to waterfalls, caving, etc. We have taken vacations in Steamboat, Colorado and Asheville, North Carolina, and, while we had a great time, are looking for a new location. Jackson Hole appeals, but we are afraid of the summer crowds and think it might be too pricy. We would like a condo, so we have room to spread out. Smugglers’ Notch in Vermont is a great place. The following story is written with younger children in mind, but it might give you a flavor of the place and then you can visit their own excellent site at www.smuggs.com.